The venue is Ahoy Rotterdam, a multifunctional venue built in 1970. It has been expanded a few times and was renovated and refurbished in 1998. The seating capacity is 10,000. Rotterdam is located in the western Netherlands at the mouth of the Rhine into the North Sea (Rhine-Meuse delta) and is largely below sea level, protected by dikes. It is the second largest city in the Netherlands (after Amsterdam) and the largest seaport in Europe (third largest in the world). Last edited by sturgess66 on Thu Sep 19, 2013 2:39 am, edited 1 time in total. 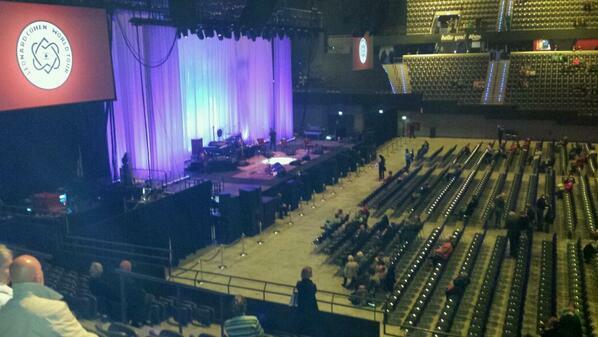 @hansoostrum - Ahoy Rotterdam: we wachten op de grote dichter en zanger Leonard Cohen!!! 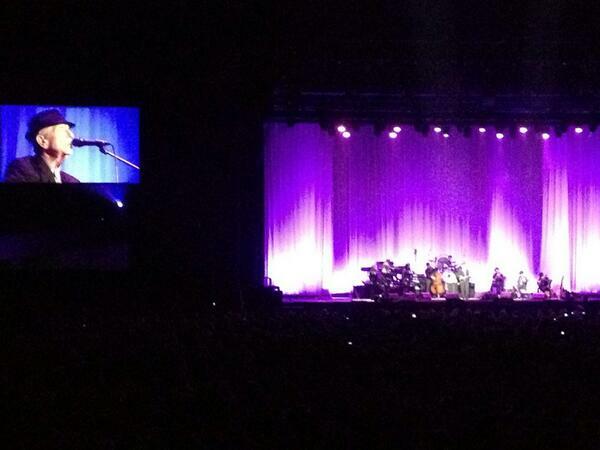 @Nikkiforlove - Leonard Cohen is in Holland. I saw only like three tour busses lol..
@kaatwijnen - Bij Leonard Cohen in Ahoy. Zo ontzettend prachtig! 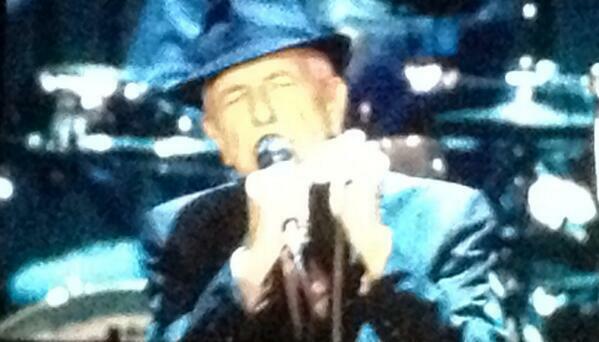 @hansoostrum - Het lijkt wel of Leonard Cohen zichzelf elk concert weer overtreft. @hermanterveen - Leonard Cohen in topvorm. [The Master is back in the Netherlands! Last year I was there and it was in one word BRILLIANT! 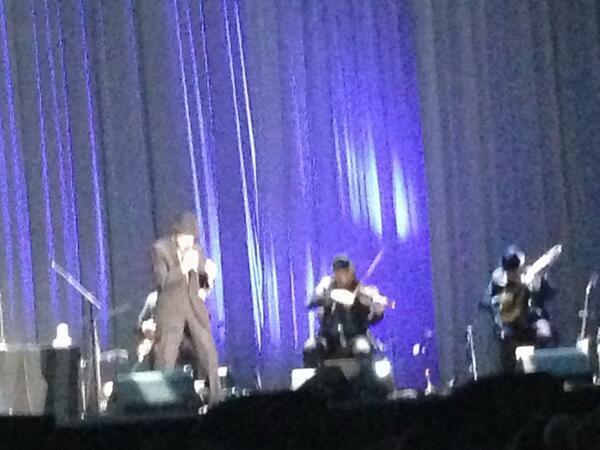 @CriseoC - Leonard Cohen in Ahoy, great concert, he couldn't stop singing...talking his beautiful lyrics, still so uptodate! Intimist, yes! Last edited by sturgess66 on Fri Sep 20, 2013 12:52 am, edited 2 times in total. Last edited by sturgess66 on Fri Sep 20, 2013 1:06 am, edited 2 times in total. This was my tenth (and probably last) show since 2008 (4 x Gent, 2 x Rotterdam, 1 x Amsterdam, 1 x Copenhagen, 1 x Antwerpen, 1 x Oberhausen). Great setlist and very enthusiastic audience (again). Leonard Cohen seemed to feel at ease. The show is still very tight without big surprises in the songs, except maybe Hey, That's No Way Goodbye. Too bad he didn't sing any new songs. I don't think we will ever meet again. What a great way to say goodbye to an old friend. Last edited by sturgess66 on Thu Sep 19, 2013 2:45 pm, edited 1 time in total. Last edited by sturgess66 on Fri Sep 20, 2013 4:31 pm, edited 2 times in total. Last edited by sturgess66 on Fri Sep 20, 2013 1:16 am, edited 1 time in total. 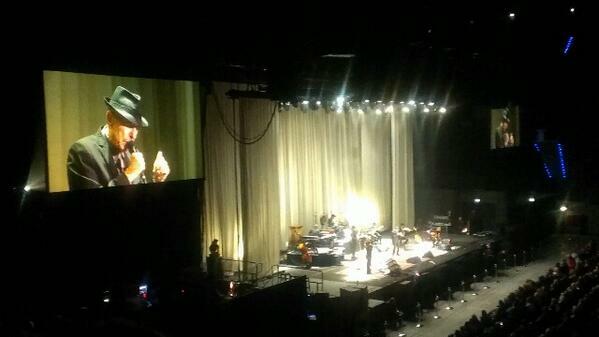 The Canadian troubadour Leonard Cohen, aged 78, was here Wednesday possible to admire. Most recently in Netherlands. That thought this evening in Ahoy was reinforced by the singer himself. "I do not know when we'll see each other again, no one knows," he says, just as on stage. "But I promise that we will give everything we have tonight." Lots of time to philosophize about the future of the singer, who in recent years frequently in the Netherlands to admire was, he did not give the crowd with a dance Cohen comes on stage. Immediately afterwards he makes Ahoy court with a cheery welcome speech. He is indeed had not come more often to Rotterdam, because he did not want to intrude, he says. Cohen hopes that people not from the domestic game have taken to get here. Too much money. He is grateful that so many people the steep stairs of the second ring, dared to climb up to see him. "Beware if you sit there, do not lean too far forward, because if you fall down," he says even. "Call us feel like you are sitting in places and you feel shortage done. Then we turn to you." But as a boxer Cohen shares immediately after punch, striking vital moving on the big stage. He plays games with the photographers, calls his friends and fans as his band members solo, he takes his hat off to them in adoration. Get his six-member band from Cohen detail the space, like the three singers. The Canadian does not only clear, but he remains involved. He never disappears from the stage, he always looks full of love. The number of times that his band members and vocalists name suggests, is not to count on one hand. The magisterial early this evening in the first part gets a sequel with more classics. Bird On The Wire Everybody Knows and belong to the best pop music of the last fifty years has produced. Cohen sings these evergreens in Ahoy as if they first sing. Sometimes with eyes closed, then just with eyes wide open and gesturing. So focused, passionate, inspired. The audience in the full Ahoy can only silent watch and the singer then reward you with one open book after another. Cohen does not let himself be distracted by it. He touches despite the eruptions of applause just increasing in trance, only awakened by the toilet break in between. That even the eternally fit Cohen's age can not beat but occasionally noting, for example in the hushed version of Hey, That's No Way To Say Goodbye. 's Suddenly very fragile look of Cohen, who plays guitar and suddenly it an old man looks, goes through the bone. Those tears flow out of this number, the expectations were perhaps too high, but in other classics such as Suzanne and So Long, Marianne. In the encore everyone looks completely fainting matter how Cohen Ahoy sets ablaze. For the last time probably. Hopefully he beats the age again as he does that tonight. Lots of terrific photos Maarten! (AP) - Artists usually get a standing ovation at the end of the evening, as thanks for their action. When Leonard Cohen went Wednesday night in Ahoy very different. When the 78-year-old singer in a trot took the stage, the audience completely exploded. Cohen show kicked off with the Rotterdam Dance Me to the End of Love and thanked the audience then thoroughly for the warm welcome. He got the laugh on his hand. "Thank you have climbed to see me so high," he was referring to the stands. "Do not lean too far over!" The Canadian took time for his show, who hardly knew jagged edges. Under the direction of the maestro drummer wielded sticks with his flair, turned the only standing guitarist pirouettes and danced the blonde backing singers on command. 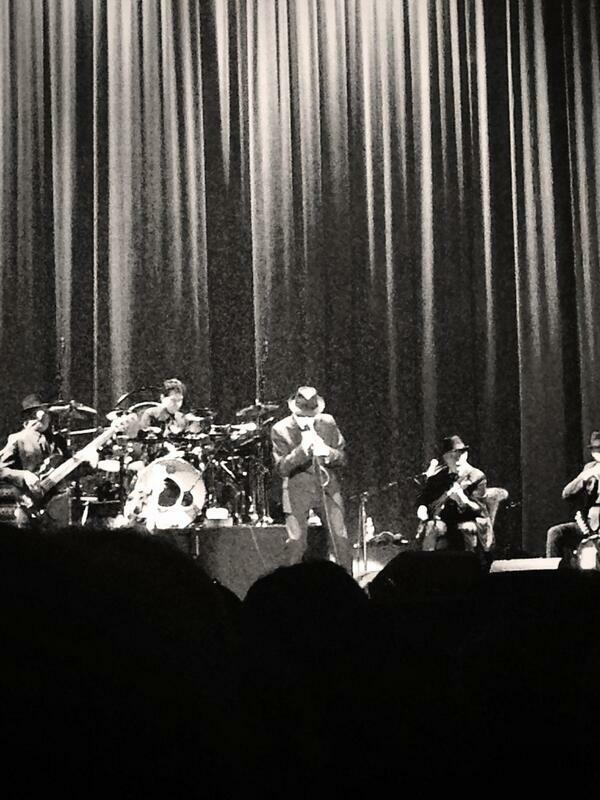 But it must be said Cohen neatly took off his hat and his musicians played a solo. After a break of twenty minutes began the second part of the action more intimate and smaller. Classics like Suzanne and Hallelujah were reviewed. Cohen may not be the youngest, he was in good voice and ventured occasionally a little dance. The audience was not the youngest, but reacted with undisguised enthusiasm and eagerly applauded. The moments that Cohen really involved his audience at the show were at the beginning of his performance and immediately after the break. And of course at the end. Valve Take This Waltz was the perfect backdrop for the singer again to thank. His band And it was the sign for the public to massively move to the stage and a sprint Cohen - perhaps for the last time - to shake a hand. A blog review from Freddy Konstantinou. His first concert, he went in only knowing a few LC songs. I do enjoy reading these epiphanies. Wederom een geweldig concert! Enorm genoten! Weet iemand ook of er een bootleg van is gemaakt en of die wellicht nog beschikbaar komt?